What's You Favorite Christmas in July Song? What's Your Favorite Christmas in July Song? 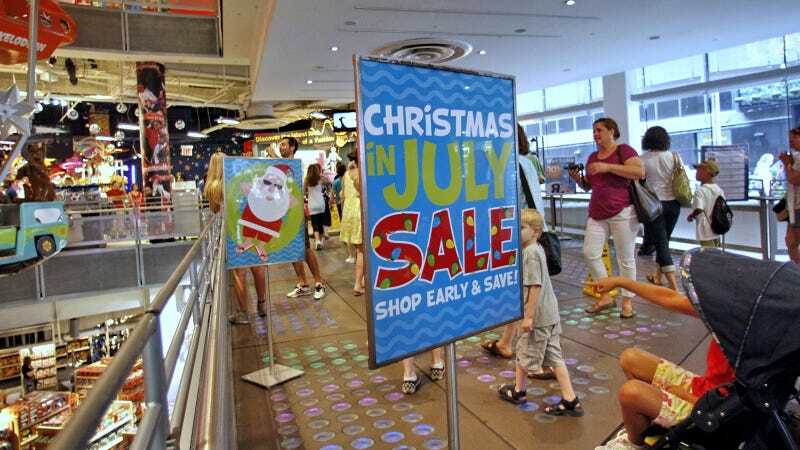 I hope you’re enjoying your Christmas in July, a fake holiday with many reasons for existing but that in the U.S., according to Wikipedia, “is more often used as a marketing tool than an actual holiday.” Imagine, a commercialized holiday like Christmas as a marketing tool. So that would make Christmas in July nothing more than Christmas...in July. Got it. In Christmas in July even a thing anymore? Twitter says maybe. In various tweets, I see a fold-out table with some presents and a fluorescent pink tree on it, a picture of someone’s work cubicle with a small crowd gathered around a Christmas tree, a reminder that the Hallmark Channel is playing Christmas movies all week (I think they’ve made enough at this point to play them all year, deflating the specialness of Christmas right out of it once and for all), and an ad for a bar & grill that begins, “It’s beginning to look a lot like cocktails!” Isn’t it always though? What’s the expression again? “It’s always Christmas o’clock somewhere”? And then there is the music. I hope you’ve been enjoying your favorite economically bent yuletide jams as much as I have today. Below is a sampling of the tunes I play to really get me into that capitalistic spirit. If you have any favorites that don’t appear on this list, please share!